Founded by a team of former Google and DoubleClick advertising leaders, Beeswax is pioneering the industry’s first Bidder-as-a-Service™ (“BaaS”). Programmatic digital advertising remains an exciting and innovative arena, and the smartest buyers require technically-sophisticated, highly customizable solutions. BeesWax believes that using an RTB bidder should be as easy as using any part of the marketing cloud. Beeswax is a leading company in the Real-time Bidding (RTB) space that buys and sells advertising inventory through online auctions. The infrastructure needed to provide an RTB service must be high-performing and have latencies less than 30ms. In their early days, Beeswax began running their infrastructure on Amazon Web Services and quickly became concerned about their operational costs. Beeswax first started with on-demand instances and then made an attempt to combat costs by purchasing reserved instances. Reserved Instances are attractive for organizations because they are sold at a discount in exchange for a long-term commitment. As Beeswax began to scale and grow, they found that they were not utilizing their Reserved Instances properly and could not prioritize their use before other instance types. Later in their journey to reduce costs, they saw that AWS has a new cost-saving instance known as Spot. Spot Instances are attractive because they are excess capacity instances sold at steep discounts compared to on-demand. When Beeswax heard about this, they quickly became interested in Spot but was hesitant due to reliability concerns – Spot Instances can be terminated with little notice and there was not an efficient way to manage them. Also, they were not able to mix their workloads with on-demand or the reserved instances they purchased. Beeswax eventually came across Spotinst Elastigroup in their journey to reduce cloud computing costs. Since they use AWS CodeDeploy and Elastic Load Balancer (ELB) to deploy their applications and workloads, they were interested in how they can use Elastigroup to reduce costs and take advantage of it’s DevOps automation capabilities to manage Spot and Reserved instances more efficiently. 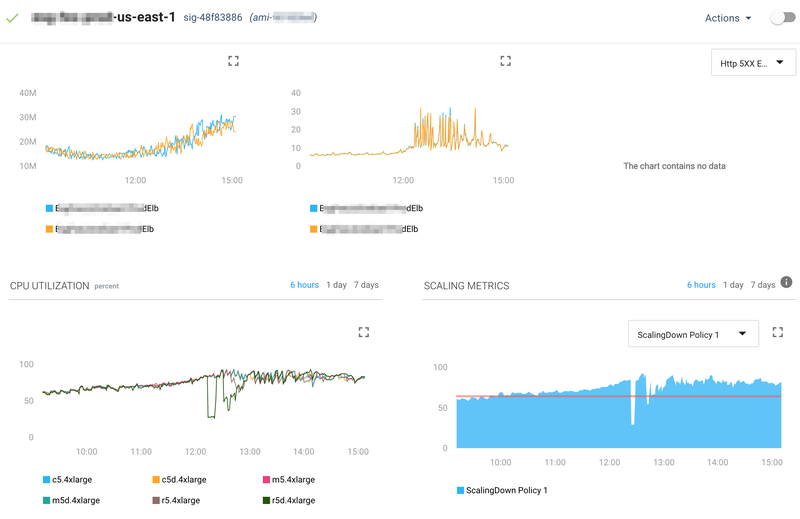 The motivation for Beeswax to try Elastigroup was to reduce costs and automate DevOps tasks so their engineers can focus more on their applications and less time maintaining the infrastructure. The first task was to import their existing ELB configuration into Elastigroup from AWS with a few clicks. After the ELB was imported, they were able to see important metrics such as requests, resource utilization, and latency over time without having to leave the Spotinst Console. Elastigroup provides an autonomous approach for autoscaling workloads. In the web console, Administrators can define a scaling policy based on utilization metrics or load targets. When scaling thresholds are reached, Elastigroup will scale the underlying infrastructure up or down without user intervention, providing users with a hands-off approach to administration. Elastigroup was also able to help Beeswax reduce costs by supporting multiple instance types and sizes. An essential part of using Spot Instances is diversifying workloads across multiple instance types. This concept is Crucial to maximize savings and most importantly, availability and continuity when using Spot Instances. With Elastigroup, Beeswax was able to run a blended cluster of multiple instance types and sizes as well as different purchasing options such as Spot, On-demand, or Reserved. To improve their reserved instance utilization, Beeswax was able to prioritize their reserved instances over Spot and on-demand with a simple checkbox. This feature helps organizations use what they already paid for instead of incurring additional costs by deploying unneeded instances. By combining a mixture of Spot and on-demand instances, workloads will be more reliable and tolerant from Spot interruptions. Elastigroup also analyzes the Spot Market using machine learning and can predict interruptions up to 15 minutes ahead of time. When Spot instances are at risk for termination, Elastigroup will begin replacing instances gracefully. Elastigroup provided Beeswax with the exact DevOps automation needed to begin using Spot instances effectively. The final integration needed by Beeswax in Elastigroup was with AWS CodeDeploy. The AWS CodeDeploy service helped Beeswax automate code deployments to EC2 instances and made it easier to rapidly release code changes and new features. Now with Elastigroup, Beeswax can keep the same workflow, reduce their operational costs with Spot instances, and take advantage of Elastigroup’s CodeDeploy integration features. CodeDeploy handles deployments in groups using revisions which contain a version of the source files that Elastigroup will deploy. Elastigroup integrates with CodeDeploy and acts as the infrastructure layer that runs the code on Spot, on-demand, or even Reserved Instances. With that functionality, CodeDeploy is now much more cost-effective and allows you to keep your application highly available with lower costs compared to on-demand instances. Elastigroup’s CodeDeploy integration can also perform blue/green deployments. When initiated, a new set of instances are provisioned with the latest version of the application. CodeDeploy will then reroute load balancer traffic from an existing set of instances to the newer ones. After traffic is rerouted to the new instances, the obsolete instances are terminated. The last and most important part of their journey to Elastigroup was the outstanding support received by Spotinst. “We received excellent support and response times from the Spotinst Support Team. We were able to rely on them to fix issues for us in a timely manner, no matter the complexity.” Ram Rengaswamy, Chief Technical Officer, Beeswax. Now, Beeswax enjoys saving over 60% each month on their AWS compute bill. Elastigroup was able to help them succeed in their mission to reduce costs by managing their CodeDeploy workloads on Spot instances as well as efficiently managing their reserved instances. Thanks to Elastigroup, BeesWax can focus more on creating quality applications for their customers and less time worrying about the underlying infrastructure. Going further, Beeswax is interested in moving to Kubernetes and is looking at how Spotinst Ocean can help them simplify the experience with its autonomous features and management.